Seller Questions - What if I Don't Know the Answer? Seller Questions – What if I Don’t Know the Answer? It's a funny thing; when we are brand new we always worry about the darndest things. This week I had a question from someone that is just getting started. His question was, “What if the seller asks me something that I don't know the answer to”? That's something I haven't thought about for a really long time. What if I don't know the answer to the question? The short answer is you don't need to worry about it. First of all it's very unlikely that any seller will ask you a question you won't know the answer to. However if the seller were to ask you a question you actually don't know the answer to, just (confidently) say, “I don't know the answer but I will find out and get back to you”. Secondly – you just need to “fake it until you make it”. Now I'm not talking about making statements that aren't true. What I am talking about is appearing confident even when you want to crawl under the table. Is Your Confidence in Short Supply Today? We all have those days. Here are a few tips to help you with that problem. Last but not least put a smile on your face! That will do it every time. After a while, you won't have to “remember” to do these things. They will just come naturally. Confidence is more a state of mind than about knowledge. Here is a short video for you on how to solve that (unlikely) problem. 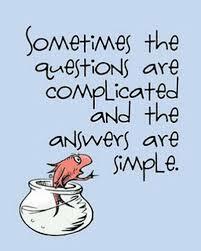 Saying the words “I don’t know” confidently is key when you truly don’t know the answer. I totally agree with this article, and think it is great advice to take the opportunity to find out the things you don’t know and be open about it. Thanks for reading and leaving your comments Joshua. I appreciate it.